Tea tree is one of the best ingredients for blemishes. It's natural and can heal blemishes in no time. 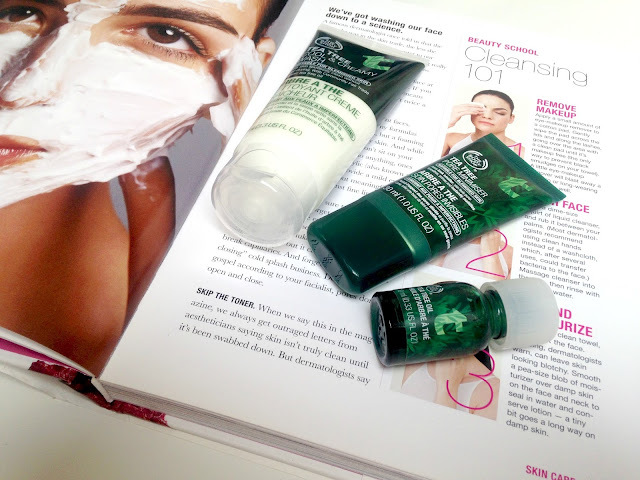 I've tried a few The Body Shop products and today I will be reviewing a few from the range. I've always wanted to try the Cool & Creamy wash after hearing many bloggers and YouTubers rave about it. I use this once a day either in the morning or the evening, depending on what cleanser I use. The cooling sensation that the wash gives is great in the mornings as it helps the skin feel awake and it helps me wake up too. I'm certainly not a morning person... It isn't drying for me, personally and it definitely helps clear my skin and soothe any breakouts. The Tea Tree Oil is a must for anyone who suffer with breakouts, simply dab a drop on the affected area and in the morning the spot will have shrunk and calmed down. For the price I think I will try another brand as I find it doesn't last too long. Lastly is the Pore Minimising Primer. I would love to say that this worked, but it didn't. It didn't minimise my pores at all. Although it didn't minimise my pores I like the thought of priming with something tea tree, so that it would help breakouts. I occasionally use it depending on how spotty I am. If it did minimise pores it would be perfect. Have you tried anything from The Body Shop's Tea Tree Range? Shop the range here!